After an unusually warm winter, the warm weather sticks around for the spring in Las Vegas. The temperature surpassed 90°F or 32°C for the first time in 2015 and reached a record 91°F or 32.8°C on Saturday March 28, 2015; the previous record high for March 28 was 89°F or 31.7°C in 1986. Today's high temperature 90°F or 32°C also broke the previous record of 88°F or 31.1°C set in 1971. , and it will hover above 90°F or 32°C through tomorrow, the end of March. The normal high temperature for this time of year would be around 74°F or 23°C. The forecast says the high temperature will drop to 82°F or 27.8°C on Wednesday April 1 and to 75°F or 24°C on Thursday April 2, 2015. 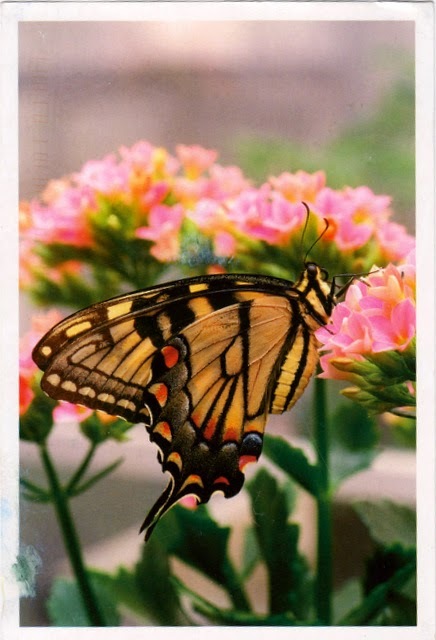 Postcard NL-2907738 from the Netherlands arrived on March 28, 2015 showing a spring scene with a beautiful butterfly.